PHP 5.1.0 pretty fast now. Since the final version of PHP 5.1.0 is released it is possible to test the performance of the interpreter again and compare it to 4.3.x. As shown earlier (see Performance of the PHP5 Object Model Compared to PHP4) this comparison was surprisingly unfavorable for 5.0.x. Zend did a good job. At least for the tested OOP features the interpreter is remarkably faster now. In conjunction with the new objects of the SPL and the database abstraction layer PDO PHP may become interesting for the enterprise after all. The bad news is the grown size of the binary which may leave some administrators unhappy. 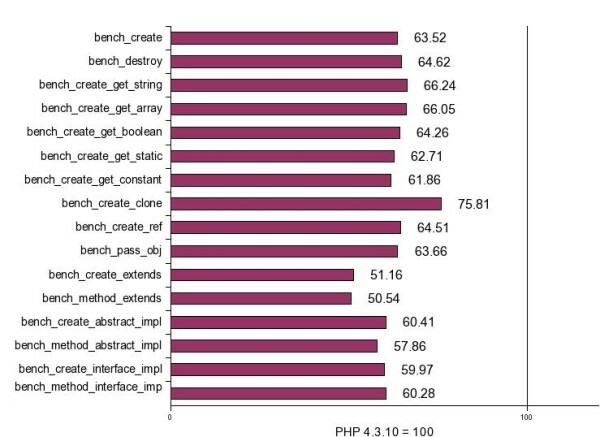 PHP 5.1.0 compared to PHP 4.3.10 Compared to older versions of the language PHP 5.1.0 is significantly faster in all tested fields.